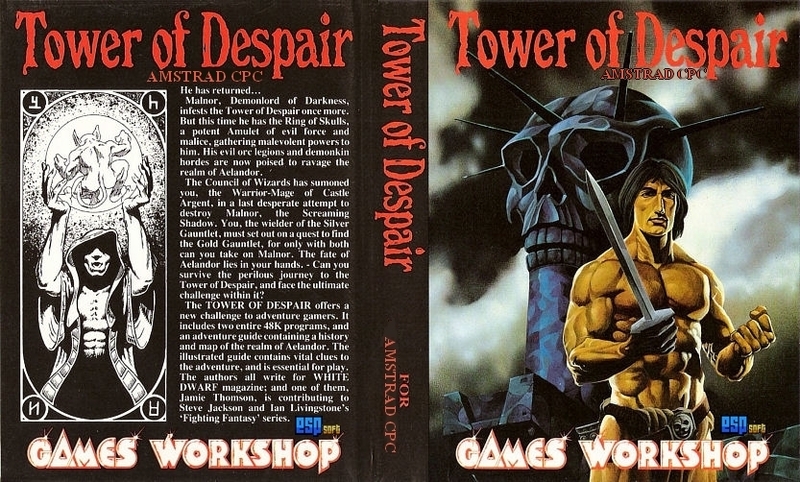 I'm very proud of showing my new experiment, Tower of Despair, a really early attemp of Games Workshop in creating videogames. Yes, they are, the creators of HeroQuest and WarHammer. It's an English text aventure I played a lot in the past and nowadays it continues without a walkthrough in internet. The game was programmed for Spectrum and Commodore64 and it got good reviews. It had a sequel, "Key of Hope", but it is Missing In Action. As I said, the game is a pure text adventure, it has no graphics, but it refers pictures in the manual in order to create atmosphere. I didn't have the manual in the past but I enjoyed the game a lot anyway, it is like RPG. It's made with The Quill and I applied it a patch to get the Spectrum game font. Second part of the game is too huge and I had to remove the ornated first letter in each location and fix the texts. Wow so cool! Do you have the cover in high resolution by any chance? Or maybe are you planning a physical release? Thanks for your comments No, I don't have a better cover. In fact, the cover is the Spectrum one but edited. It's the best in resolution I could find. I'm not planning to make a physical release at the moment.